Paul Jackson Pollock (January 28, 1912 – August 11, 1956) was an influential American painter and a major force in the abstract expressionist movement. His abstract mannerisms contained in his action paintings demonstrated Pollock's great interest in exposing the workings of the subconscious mind through a seemingly incongruous arrangement of the subject matter. This dream-like art, based on familial memories of his environment, became Pollock's responsibility to initiate his own personal and spiritual transformation and to influence others with this change towards a new pictographic imagery. Pollock underwent many changes in his portrayal of artistic imagery demonstrating that life can be layered in many ways but never hidden from oneself. Paul Jackson Pollock was born in Cody, Wyoming, to LeRoy and Stella Pollock on January 28, 1912. He was the youngest of five boys. A year after Pollock was born, the family relocated and most of his upbringing took place in Arizona and California. His father pursued farming, but found it hard to make a living, so he took up work as a surveyor and worked at many scenic locations along the Southwest. Pollock sometimes joined his father on these trips to the Grand Canyon and other such landscapes, and later credited these experiences for creating profound memories which influenced his artistic vision forever. As a young man, he studied at Manual Arts High School in Los Angeles, and it was there that his interest in art began to flourish. Two of his brothers, Charles and Sanford, were also developing as artists. His eldest brother, Charles, soon left for New York to study at the Art Students League, and he urged Pollock to come and study there with him. There, they both studied under Thomas Hart Benton at the Art Students League. 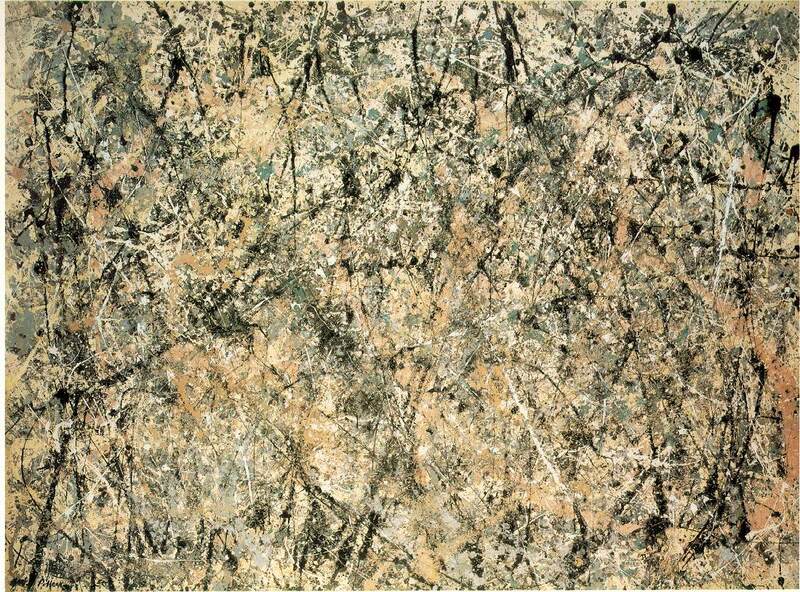 It was during this time that Pollock dropped his first name, Paul, went by his middle name, Jackson. Under Benton's guidance, Pollock analyzed paintings and learned the essentials of drawing and composition. He observed fresco painting first-hand with Mexican muralist, José Clemente Orozco. This organic education in mural painting is said to lead him to an interest in painting large scale works of his own. 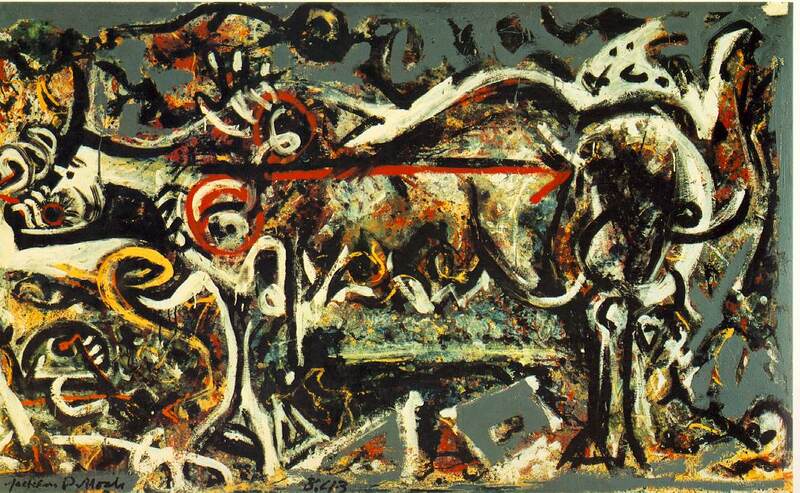 Also during this time, Pollock's work began to reflect Benton's style and his "rural American scene" aesthetic. Benton's influence on Pollock's work can be seen most prominently in his usage of curvilinear undulating rhythms. His remarkable expression of these rhythms and movement played an essential part in his work, even in his later, more abstract paintings. Other early influences include Picasso, Miró, and the Surrealists, as well as another Mexican muralist by the name of David Alfaro Siqueiros, who in 1936 established an experimental workshop in New York. It was there, in Siqueiros' workshop, that Pollock first encountered the use of enamel paint and was encouraged to try unorthodox techniques such as pouring and flinging the liquid material to achieve spontaneous effects. Even as his art was gaining in assurance and originality, Pollock was experiencing personal turmoil and recurring bouts of depression. He was also struggling to control his alcoholism, which would continue to plague him throughout his life. His brothers Charles and Sande, with whom he shared living quarters at 46 East 8th Street in Manhattan, encouraged him to seek treatment, including psychoanalysis. Although therapy was not successful in curbing Pollock's drinking or relieving his depression, it introduced him to Jungian concepts that validated the subjective, symbolic direction his art was taking. In late 1941, Sande wrote to Charles, who had left New York, that if Jackson could "hold himself together his work will become of real significance. His painting, like this Composition no. 16, is abstract, intense, evocative in quality." 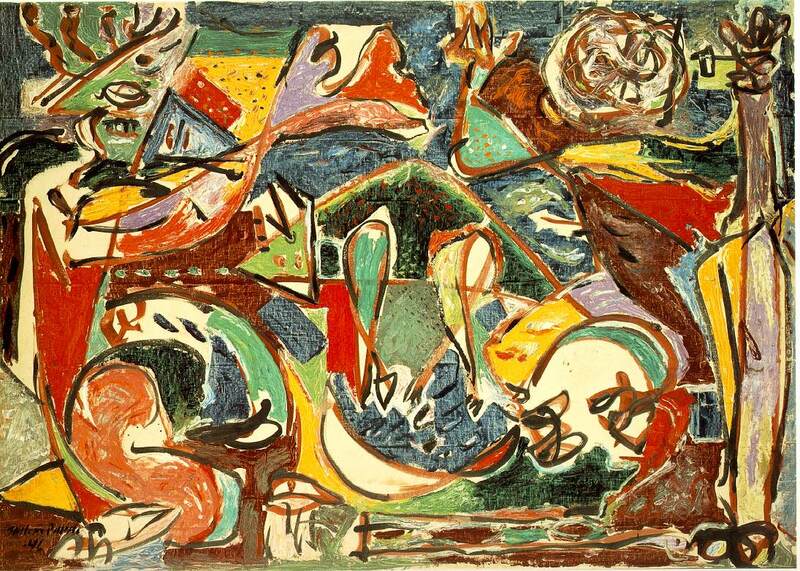 Jackson Pollock's Composition no. 16. Jackson Pollock's Studio in Springs, NY. 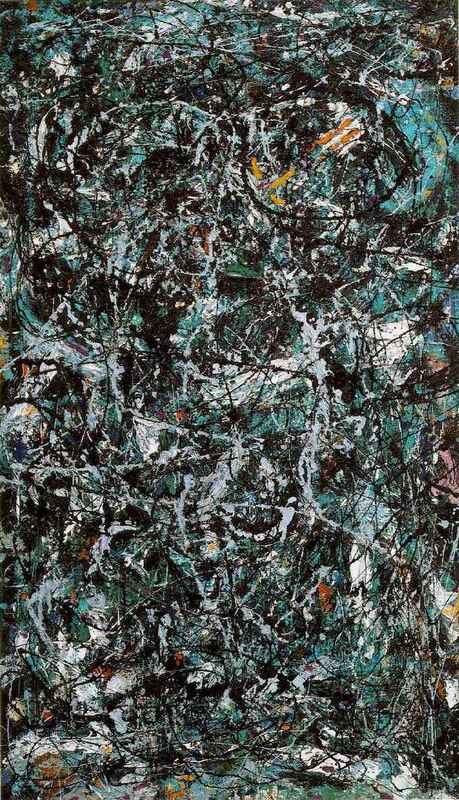 Pollock's work after 1951 was darker in color, often only black, and began to reintroduce figurative elements. Pollock had moved to a more commercial gallery and there was great demand from collectors for new paintings. In response to this pressure his alcoholism deepened, and he distanced himself from his wife and sought companionship in other women. After struggling with alcoholism his whole life, Pollock's career was cut short when he died at the age of 44 in an alcohol-related, single car crash in Springs, New York on August 11, 1956. One of his passengers, Edith Metzger, died, and the other passenger, his girlfriend Ruth Kligman, survived. 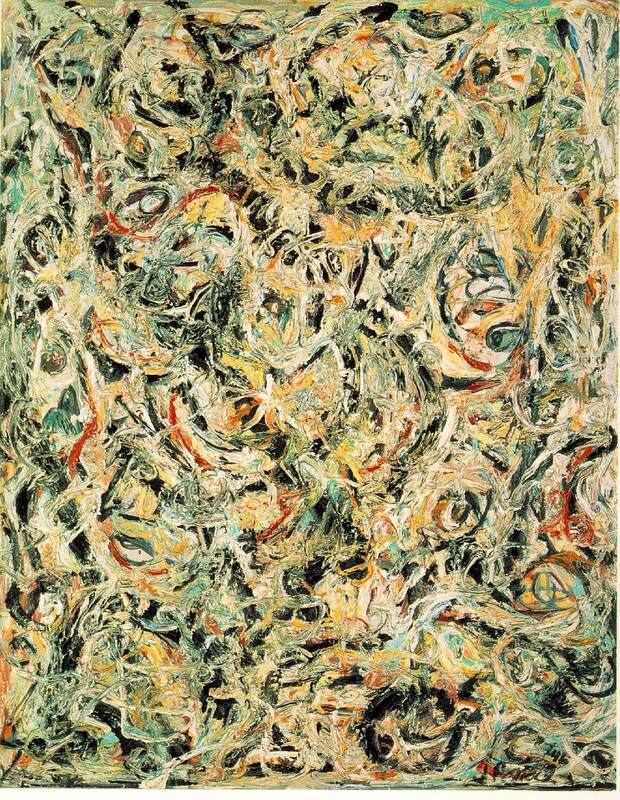 After his death, his wife Lee Krasner managed his estate and ensured that his reputation remained strong in spite of changing art-world trends. After Lee died, they were buried next to each other in the Green River Cemetery in Springs. Their graves are marked by large stones embedded in the ground which lay near each other. Jackson Pollock's stone is fairly big and Lee Krasner's stone is the smaller of the two. Pollock and Krasner had no children. Their Springs house and studio is owned by the Pollock-Krasner Foundation which is administered by State University of New York at Stony Brook which schedules tours of the studio. The immediate Springs neighborhood is on the National Register of Historic Places. In 2000 a biographical film titled Pollock was made about his life. Marcia Gay Harden won the Academy Award for Best Supporting Actress for portraying Lee Krasner. The movie was the project of Ed Harris who portrayed Pollock and directed it. He was nominated for Academy Award for Best Actor. In November 2006 Pollock's "No. 5, 1948" became the world's most expensive painting, when it was auctioned to an undisclosed bidder for the sum of $140,000,000. The previous owner was film and music-producer David Geffen. Controversy also swirls over the alleged sale of No. 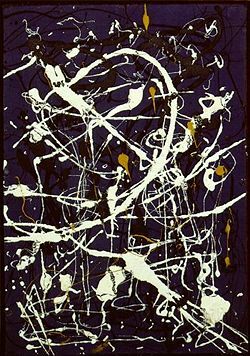 5, 1948 in 2006 for a reported $140 million Pollock's work has always polarized critics and has been the focus of many important critical debates. Harold Rosenberg spoke of the way Pollock's work had changed painting, "what was to go on the canvas was not a picture but an event. The big moment came when it was decided to paint "just to paint." The gesture on the canvas was a gesture of liberation from value — political, aesthetic, moral." 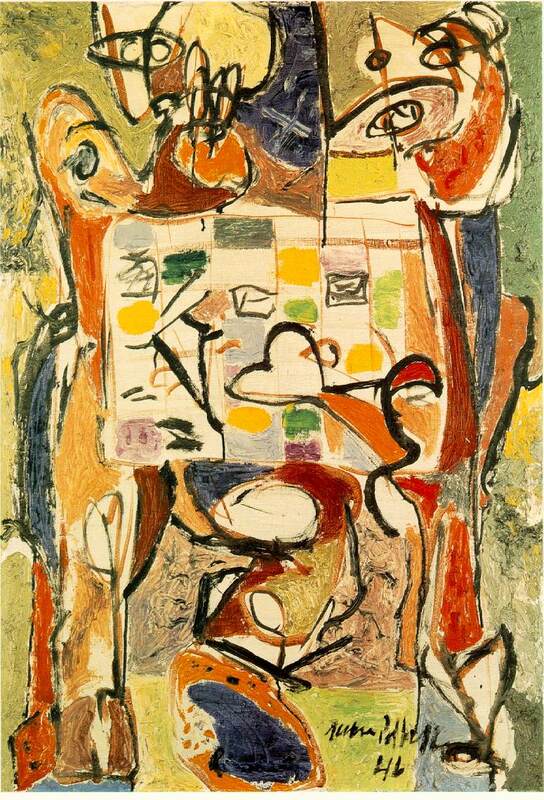 Clement Greenberg supported Pollock's work on formalistic grounds. It fitted well with Greenberg's view of art history as being about the progressive purification in form and elimination of historical content. He therefore saw Pollock's work as the best painting of its day and the culmination of the Western tradition going back via Cubism and Paul Cézanne to Claude Monet. Posthumous exhibitions of Pollock's work had been sponsored by the Congress for Cultural Freedom, an organization to promote American culture and values backed by the Central Intelligence Agency. Certain left wing scholars, most prominently Eva Cockcroft, argue that the United States government and wealthy elite embraced Pollock and abstract expressionism in order to place the United States firmly in the forefront of global art and devalue socialist realism. In the words of Cockcroft, Pollock became a "weapon of the Cold War." Painter Norman Rockwell's work Connoisseur also appears to make a commentary on the Pollock style. The painting features what seems to be a rather upright man in a suit standing before a Jackson Pollock splatter painting. 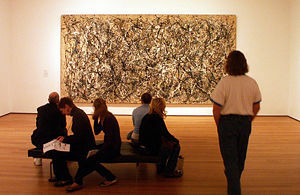 The contrast between the man and the Pollock painting, along with the construction of the scene, seems to emphasize the disparity between the comparatively unrecognizable Jackson Pollock style and traditional figure and landscape based art styles, as well as the monumental changes in the cultural sense of aesthetics brought on by the modern art movement. Feminists criticized the machismo surrounding abstract expressionism, seeing Pollock's work in particular as the acting out of the phallocentric male fantasy on the symbolically supine canvas. Other critics, such as Craig Brown, have been astonished that decorative "wallpaper," essentially brainless, could gain such a position in art history alongside Giotto di Bondone, Titian, and Velazquez. Reynolds News in a 1959 headline said, "This is not art — it's a joke in bad taste." Paul Simonon, bassist from the English punk rock band The Clash who had previously attended art school, said "he had based their first – revolutionary – clothes designs primarily on Pollock's work." In an episode of Daria, "Daria's Dance Party," Jane Lane (in preparation for a dance) paints the school gymnasium in honor of Pollock's untimely death. A 1989 episode of the television program Unsolved Mysteries featured a group of scientists exhuming Pollock's grave and examining his corpse for signs of foul play relating to his death. No conclusive results were found, since worms had eaten his body. In the movie film Mona Lisa Smile, actress Julia Robert's character takes her class to see a Jackson Pollock painting. The influence of Native American art is very evident in the work of Jackson Pollock. Pollock and Native artists work using a similar process; Pollock takes direct images from the unconscious mind like images from the natives' spiritual world; he uses aesthetic primitivism; he becomes part of the painting, akin to native American sand painters, and he exhibits similarly universalized subject matter to the Native Americans. Essentially a timeless visual language is explored when linking Native American primitive art to Pollock’s modernist art. Pollock had been influenced by Native cultures from his early days in Arizona, where he witnessed native lore, ceremonies and myths. This provided him with an incentive to visit an exhibition – Indian Art and the United States at the Museum of Modern Art in 1941. There he witnessed the art of Native American cultures, notably the method of "sand painting." He attended its demonstration several times. This art form performed by medicine men in a focused or "trance like" state influenced Pollock greatly as he developed his famous pouring method; the medicine men pour colored sands onto a flat surface, which they can approach from all sides as the image unfolds. Pollock stated, "I feel nearer, more a part of the painting, since this way I can walk round it, work from the four sides and literally be in the painting. This is akin to the methods of the Indian sand painters of the West. This keynotes the concept of surrealist automatism, a process in which painting unfolds "automatically." The process is demonstrated in Andre Masson's work; "Meditation on an Oak Leaf," which Pollock admired greatly. Pollock was familiar with other "in vogue" concepts; of Psychoanalysis and Primitivism, which provided another basis for his connection to Native American art. 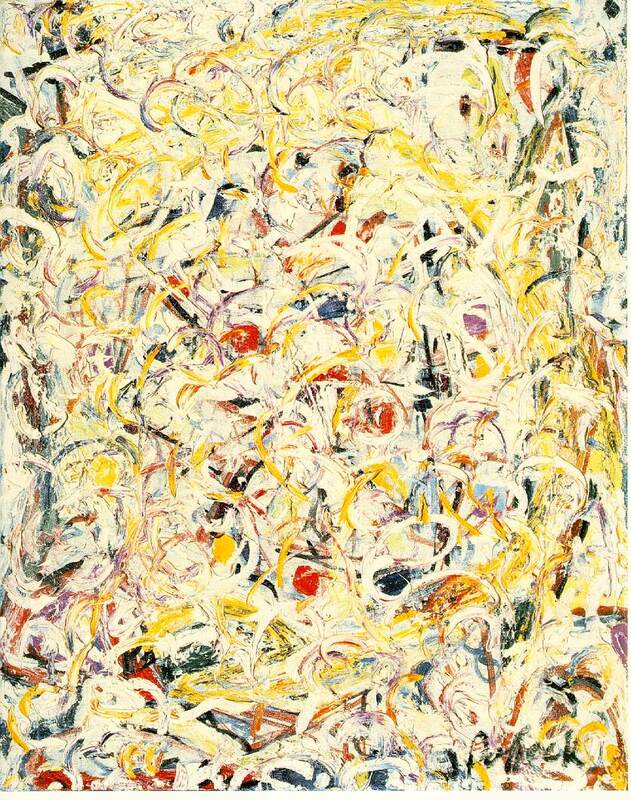 Pollock created many "psychoanalytical drawings" whilst he was being treated for alcoholism by Jungian psychoanalysts. These drawings were used by Pollock to facilitate discussion about his own mental state with his doctors. One could say that the source of these drawings - the unconscious/subconscious is similar to that of Native American cultures, where hallucinogenic states prompted by the use of drugs such as the san-pedro cactus, prompt a journey into the spiritual world. This world is one where full blown hallucinations may combine abstract and figurative images. The resulting portrayals of the spirit world are similar in aesthetic to Pollock's psychoanalytical drawings because they combine both the abstract and the geometric, spanning from the "inner depths" of the mind. 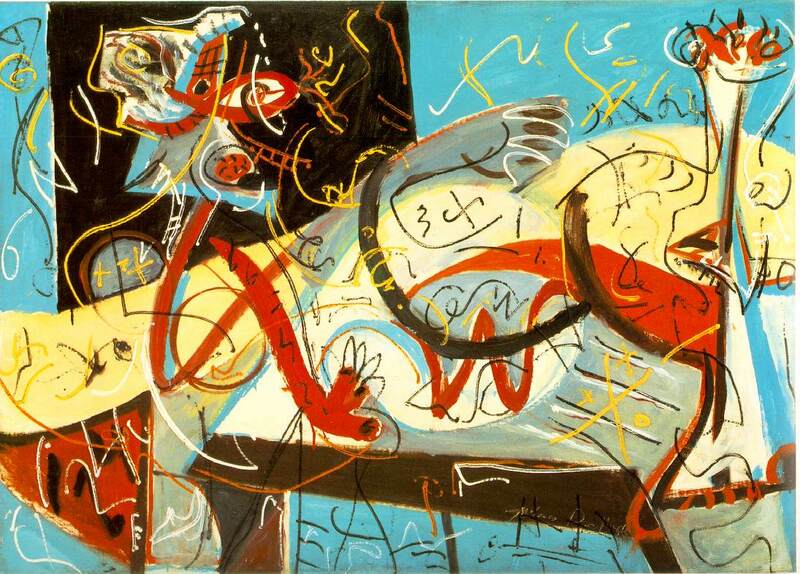 Pollock was very influenced by the work of Pablo Picasso, and the work Guernica, after reading an article by John D. Graham entitled Primitive Art and Picasso. A key concept within this article was the exploration of Ahistorical issues of psychology that link the personal and the primordial. The idea that all human beings are "wired the same way" provides the basis for the idea that they can all be affected by similar subconscious symbols and imagery. Psycho-analytical drawings of Pollock’s, as a result, contained a strange resemblance to Picasso’s. These drawings, like the art of ancient cultures, featured semi-human monsters, sharply horned masks, and dagger-like tongues, often shifting into different forms and surrounded by patterns or shapes. Primitivism in itself was a popular aesthetic amongst modernists, and Pollock chose a culture "close to home" to explore visually. As a result, the subject matter between Pollock's art and the art of Native America becomes similar. The focus is on universal symbols and concepts such as animals, cycles of life and birth or gender, and the means of exploring these subjects is a focus on essence rather than naturalistic representation. Pollock was taught by Thomas Benton, who emphasized this focus on essence and analytical drawing. In Pollock's Birth the "essence of birth," you might say, is explored through violent transformational and shifting imagery. A collection of invented or derived, unclear, and ambiguous images seem to come together to create something that visually inspires, universally, the essence of the subject. Like Native American art, the images are constantly transforming and shifting, becoming part of others. Native Chavin art is well-known for holding multiple readings depending on how one observes the overall image, perhaps from upside-down. Native art focuses on a constant world of change, seasons, weather, life and birth etc. to inspire these transformations. 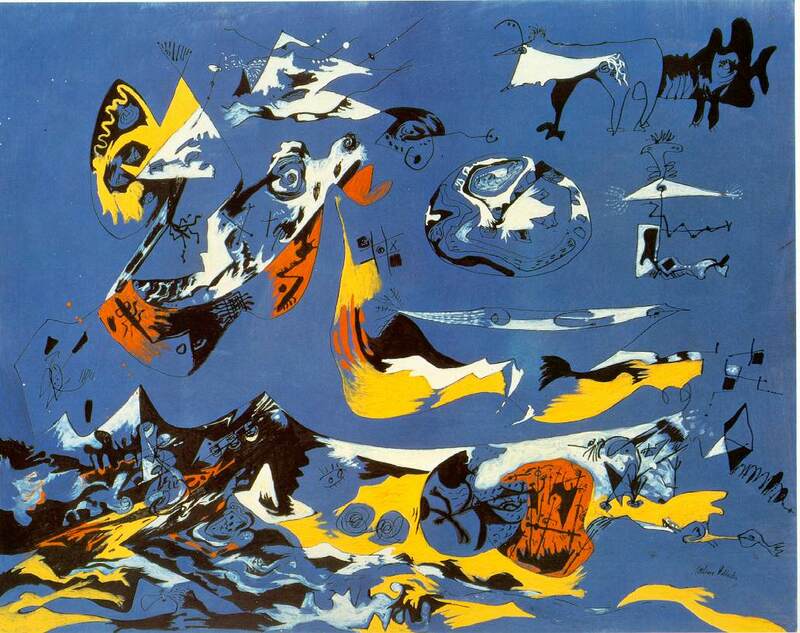 The "strong graphic rhythms, zoomorphic imagery, and myths of man-beast transformation in the art of these cultures had made a deep impression [on Pollock]'". Although these links can be asserted visually, one can question them. Pollock was not well-known for being definitive in his approach to explaining his work. Pollock once declared, "While he may well have talked up shamanism or alchemy, and even nurtured some superstitions about ritual and healing," he never suggested that this kind of thing shaped the way his paintings were made or should be understood. 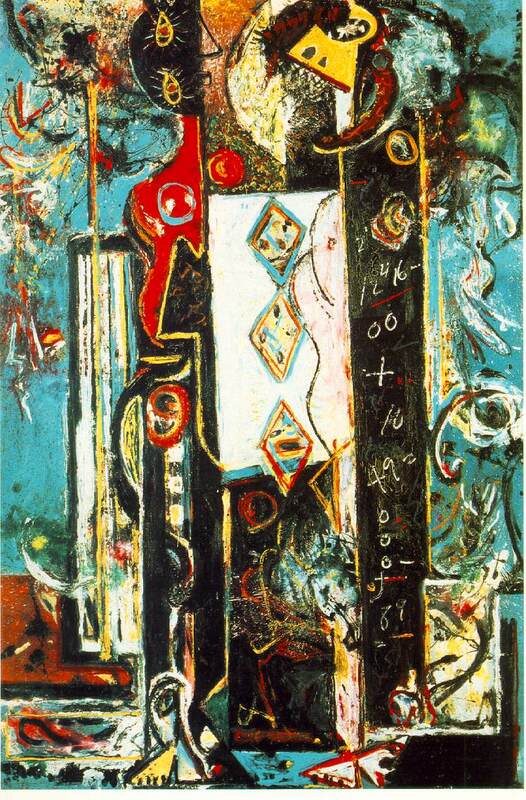 In 1944, Pollock stated, "Some people find references to American Indian art and calligraphy in parts of my pictures. That wasn’t intentional; probably was the result of early memories and enthusiasms." However, one can conclude, despite these statements, that Pollock could not have resisted popular art theory and philosophy, and was still greatly influenced by sand-painting methods and modernist primitivism. Ultimately, The art of Jackson Pollock is definitely linked to the art of the Native Americans. Each look at images from an altered state of mind – the unconscious/subconscious (the idea of psychoanalysis) Each follow aesthetic primitivism. They use a similar "automatist" process; being in the work, and of "pouring." They both focus on "essence" and universal images, with a similar mixing of abstract and figurative, transforming forms. Also, the linking of modernist work and primitive work can show us the idea of a timeless visual language – something "wired into" all human beings. Posthumous exhibitions of Pollock's work had been sponsored by the Congress for Cultural Freedom, an organization to promote American culture and values backed by the CIA. Certain left wing scholars, most prominently Eva Cockcroft, argue that the U.S. government and wealthy elite embraced Pollock and abstract expressionism in order to place the United States firmly in the forefront of global art and devalue socialist realism. SOCIALIST REVIEW Issue 229 (April 1999) www.socialistreviewindex.org. In the words of Cockcroft, Pollock became a 'weapon of the Cold War'. Others such as artist, critic, and satirist Craig Brown, have been "astonished that decorative "wallpaper," essentially brainless, could gain such a position in art history alongside Giotto, Titian, and Velazquez." 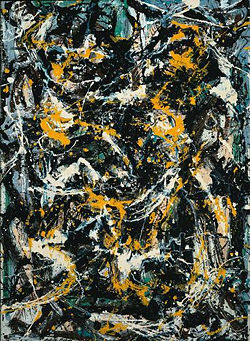 Pollock's cultural impact can be measured by the number and nature of the references to him and his work in popular culture. In Destroy All Humans! 2 the protagonist Crypto makes a remark about modern art, saying, "So, modern art, huh? Jackson pollock pees on a canvas and sells it for fifty grand? What's with that?" On an episode of Red Dwarf, Lister tells of barfing off of the Eiffel Tower and creating a "Jackson Pollock," later, Kryton the robotic butler gets drunk and declares that he, too, will create a "Jackson Pollock." ↑ Jackson Pollock, "My Painting," in Pollock: Painting, edited by Barbara Rose, (New York: Agrinde Publications Ltd, (1980), 65; originally published in Possibilities I, (New York, Winter 1947-1948). ↑ Expression of an age. 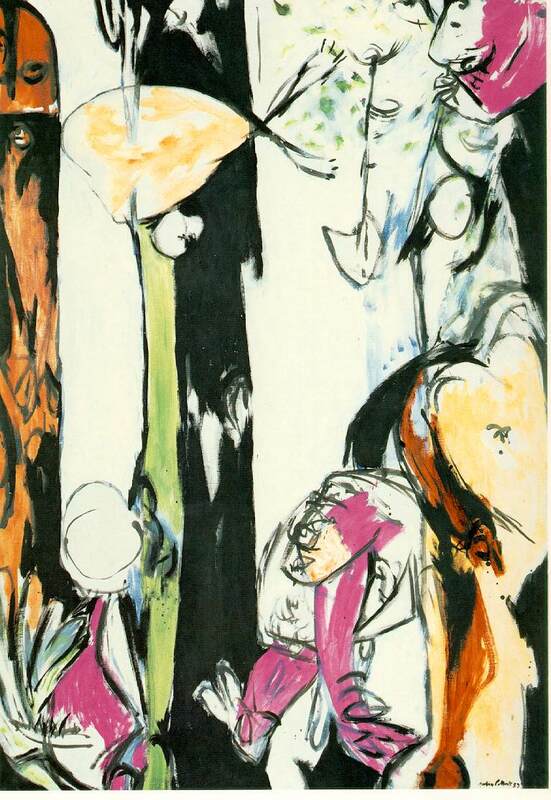 ↑ Eva Cockcroft, "Abstract Expressionism, Weapon of the Cold War" in Artforum 12(10) (June 1974): 43-54. ↑ Expression of an agewww.socialistreviewwindex.org. ↑ Expression of an age www.socialistreviewindex.org. This page was last modified on 12 March 2018, at 19:27.